Does My Stomach Actually Shrink When I Lose Weight? Find the truth about questions that pique your curiosity in our series, “The Short Answer.” Gastroenterologist Maged Rizk, MD, answers this one. Q: Does my stomach actually shrink when I lose weight? A: Not exactly. But here’s why you might feel full. 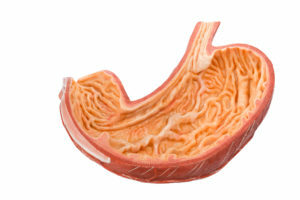 Our stomachs have a reflex called receptive relaxation: As food enters your stomach, the muscles relax and expand out to accommodate more volume. In fact, your stomach can expand up to five times its volume after a meal as compared to before. Some studies suggest that neurons surrounding and within our stomach wall actually control receptive relaxation. After losing weight, they may cause our stomachs to have “less elasticity.” This is also related to hormonal changes that affect our feelings of hunger and thirst, namely changes in the hunger hormones ghrelin and leptin. All these factors can control whether you feel hungry or full. And none of them are related to any changes in the size of your stomach (even though it might feel like it).